Bollywood’s prolific director Priyadarshan doesn’t do pretentious. Ask him whether his latest comedy, Kamaal Dhamaal Malamaal (KDM), which stars a clutch of relative unknowns, has a better chance at the box office now that Akshay Kumar’s OMG Oh My God! release has been held back in this region, a pragmatic ‘no’ follows. His film will be the only new Hindi release this weekend. “But the solo release is only in Dubai. In other places such as India, Akshay Kumar is a much bigger star and he has a bigger draw at the box office. We can’t compete with that,” said Priyadarshan in an interview with tabloid! “As a filmmaker it would be wrong on my part to think in those narrow terms either,” he added. Based on the Malayalam hit Marykkundoru Kunjaadu, KDM, starring Shreyas Talpade, Nana Patekar, Om Puri and Mahdurima, is a classic cinematic quickie by Bollywood standards. No fancy locales, no titillating item numbers and no buzz. “This is a small film, I made it in 25 days straight. We can’t afford to do a lot of publicity and create hype around it because we wanted to stick to the small budget. We know what we are doing,” said Priydarshan. But the director, who has delivered money-spinners with big heroes such as Hera Pheri, Hungama and Garam Masala, isn’t worried. “Sometimes you need to try to make films which doesn’t have all those big stars. These days, stars are themselves producing and directing films so you can’t make every film with a big star. Plus, this film is slightly experimental. 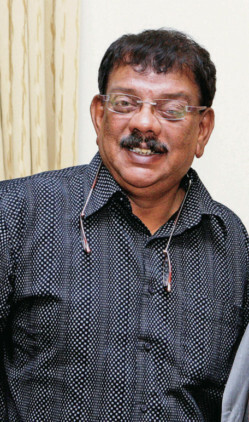 I am confident that we will recover our costs,” said Priyadarshan. Next on his to-do list is a project with Kumar. As usual, the film is a rehash of one of his Malayalam hits. This time around, he plans to remould Mohanlal blockbuster Arabiyum, Ottakavum, Madhavan Nairum, which was set in Abu Dhabi. However, for the Bollywood version he’s planning to scout for locations in Dubai.